What a week! 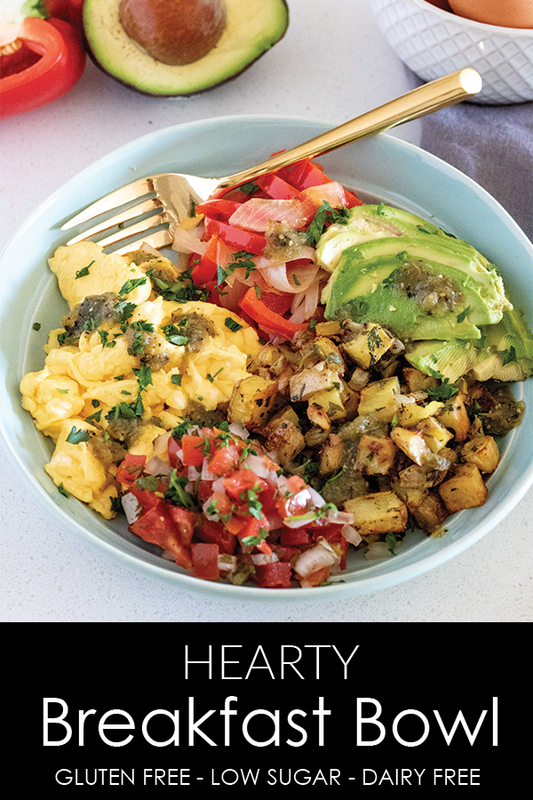 I have been working so hard to get back on track and organized so I can bring you guys some great new content heading into Fall (ahem, like this hearty breakfast bowl). Can you believe it is August 1st already? How did that happen?? Not that I am that upset, because, let’s be honest Fall = football…but still. Time is moving so quickly! I feel like as soon as August hits, its a scramble for back-to-school. I don’t have kids, but I still feel like there is a push to re-organize, clean out, and get back on track after a season of fun in the sun. 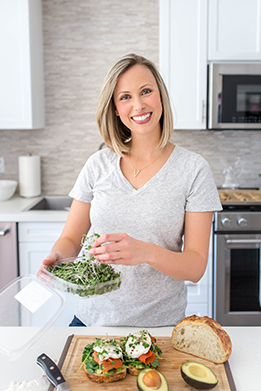 Coming up on the blog I am going to be sharing some fun recipes to help you get through the craziness of this new season! We’re going to be talking about meal prep, healthy snacks, and easy ways to repurpose leftovers. Sounds pretty great, right?! 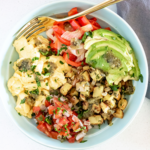 Let’s start with this super easy, stick-to-your-ribs breakfast bowl. I don’t know about you, but I am always wondering how to use up leftovers in creative ways. It is pretty much a given at least every other week I make roasted potatoes. Whether its those little fingerlings, my favorite parsley potatoes, or the best sweet potato hash on the planet, potatoes are happening. And normally I make WAY too big of a batch so I can enjoy them throughout the week. The key to this dish is to evaluate what you have in your fridge and work it in. Sometimes I already have sautéed or roasted vegetables, or peppers and onions from taco night. In they go. Leftover potatoes, rice, quinoa? Yep. You can repurpose your leftovers by adding a couple of scrambled eggs, and avocado (obviously). Badda bing, badda boom. You’ve got yourself a breakfast that will power your whole morning! 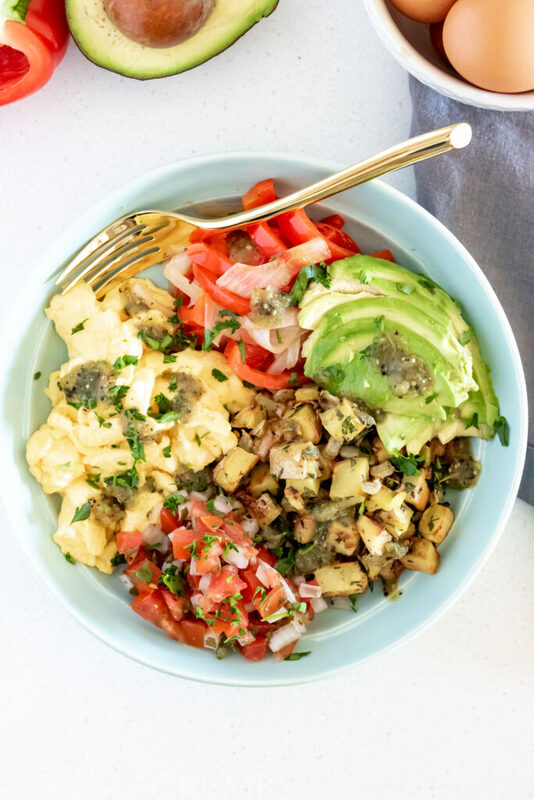 A hearty breakfast bowl full of fluffy scrambled eggs, roasted potatoes, and sautéed vegetables. Non-dairy, gluten-free, and vegetarian. In a large frying pan over medium heat, add 1 Tbsp of your cooking oil. Add your leftover cooked vegetables OR peppers and onions and sauté until soft and tender. About 5-10 minutes. Your cooked vegetables may need less time, so keep an eye on them. Season with salt and pepper to taste. Remove from heat and arrange on your serving plate/bowl. In the same frying pan, over medium heat, add the leftover potatoes and fry until reheated and crispy. Remove from heat, and arrange next to your peppers and onions. In the same frying pan, over medium heat, add the remaining oil and scrambled eggs. Work the eggs with a spatula, moving from the edge, towards the center. Tilt the pan to move any liquid egg towards the edge of the pan. Continue to scramble the eggs until cooked to desired doneness. Season with salt and pepper to taste. 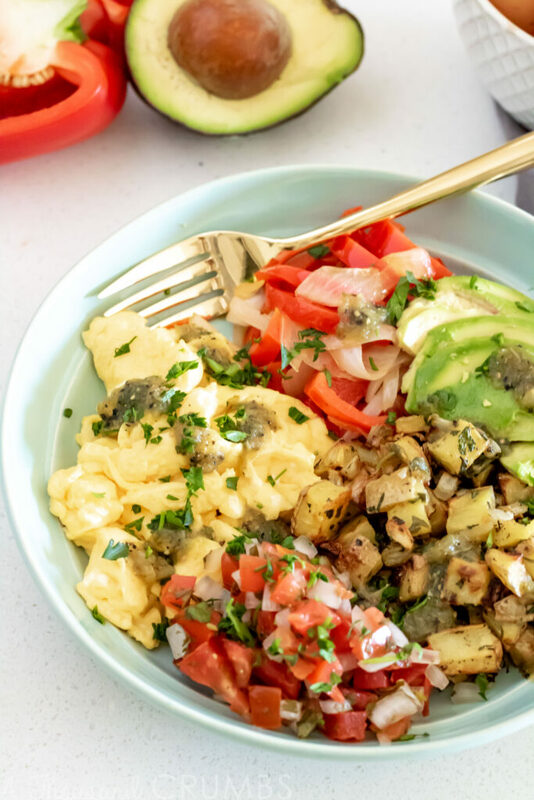 Add your scrambled eggs to your serving dish, along with the avocado, and your salsa(s). This is a great way to use up leftovers. Use what you have. The idea is to have a starch/grain, fat, protein, and vegetables. Get creative!